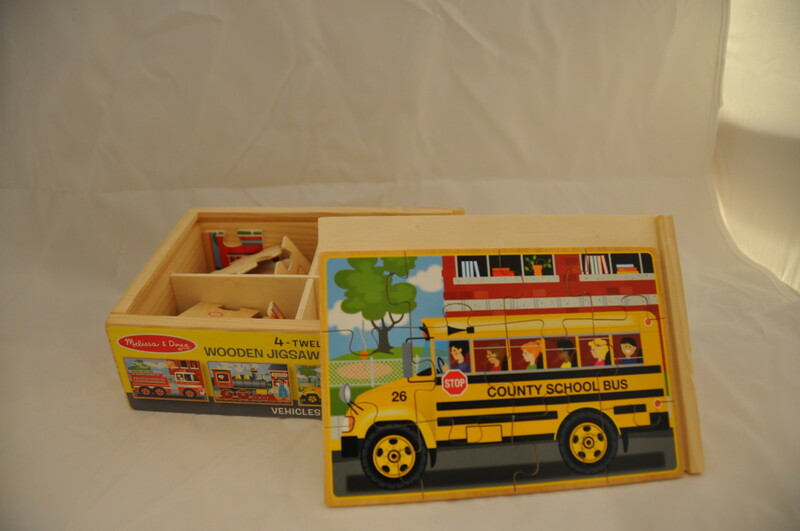 When it comes to timeless, classic toys for kids, puzzles are hard to beat. 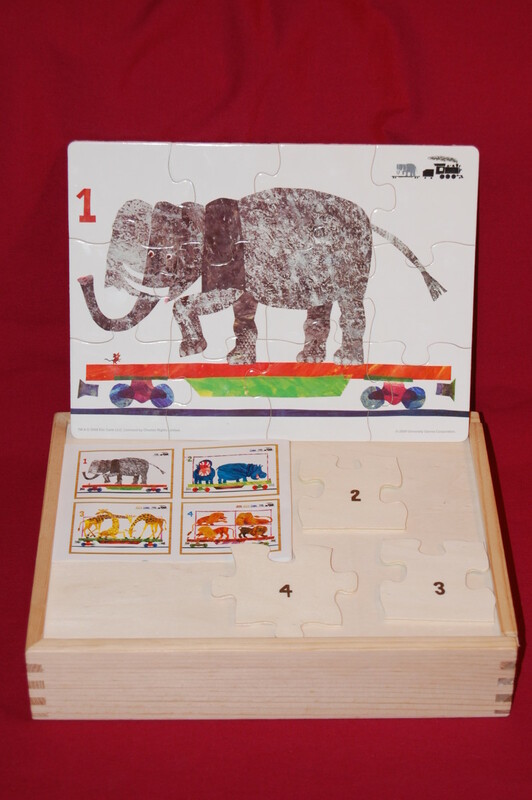 Through puzzles, young children can explore visual perceptual concepts, and refine hand manipulation skills. And of course none of this would work if puzzles weren’t just plain fun. How many times does the average child put together a single puzzle, before that child is ready to get rid of that puzzle? Hundreds? Thousands? How many toys have this kind of appeal to young children? Jigsaw puzzles originated in 1760 in England, made by a mapmaker to help children learn geography. 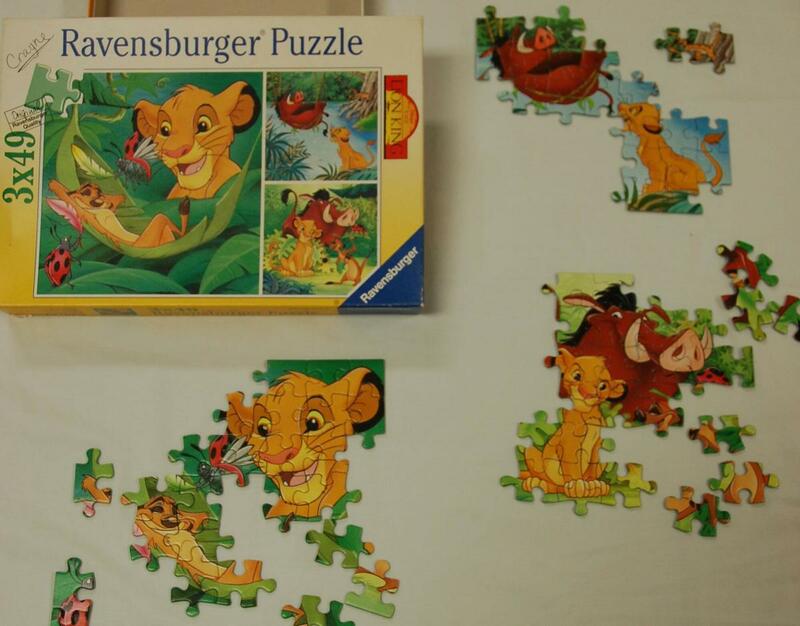 From there, puzzles were used to help children learn history, with kings and queens depicted in puzzles. These puzzles were expensive, handcrafted from wood. 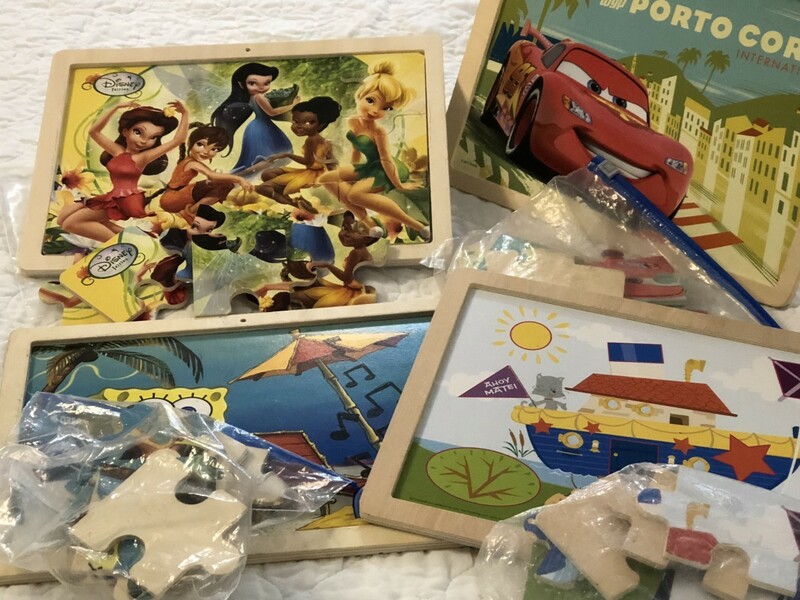 Puzzles became more affordable and were popularized in the 1920s and 1930s. 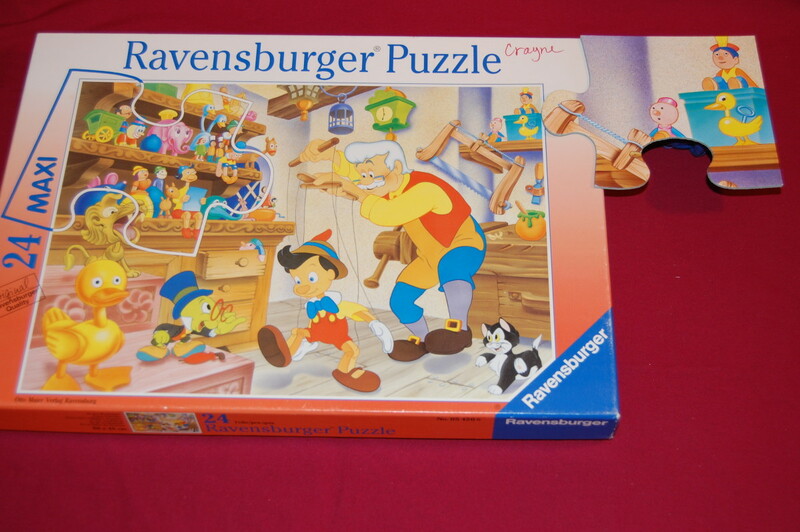 There are three main categories of puzzles, non-connecting puzzles, connecting puzzles, and interlocking puzzles. Some consider this to be the progression of difficulty with puzzles, but that is not necessarily true. Let’s explore each type of puzzle, and how to modify puzzles when they are too difficult. 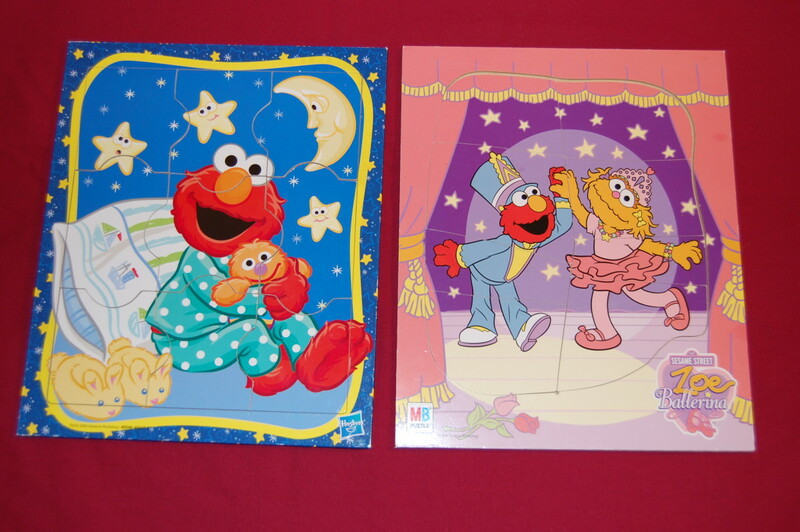 This should help you choose the appropriate puzzles for your child. 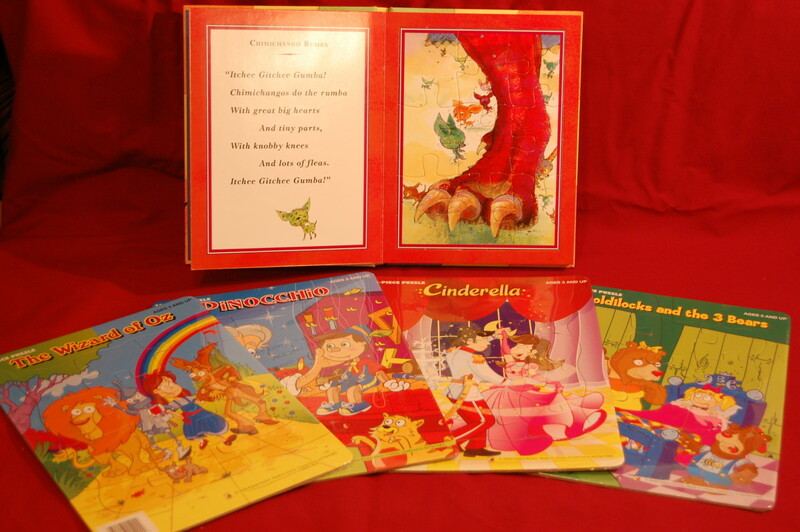 The simplest of puzzles for young children are non-connecting puzzles. 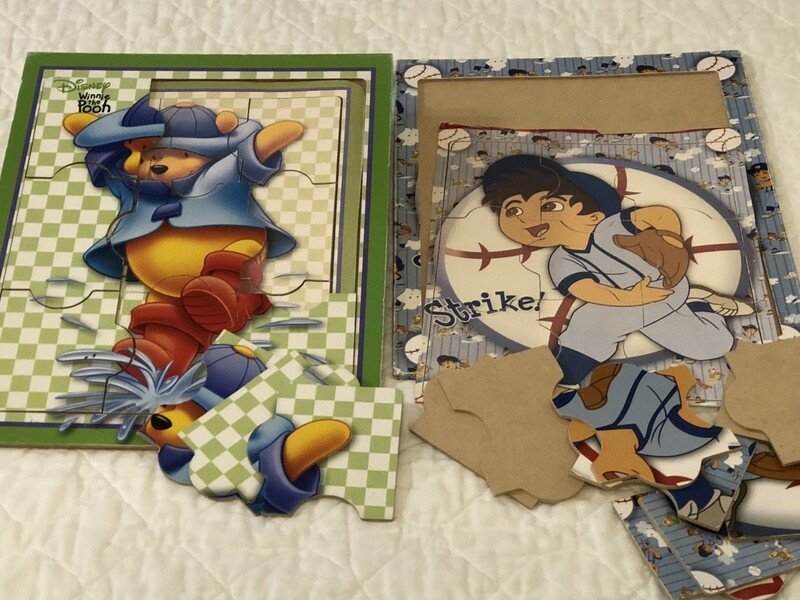 These are puzzles made up of separate pieces that do not fit with each other. For example, a 4-piece puzzle with an apple, banana, bunch of grapes, and watermelon slice. 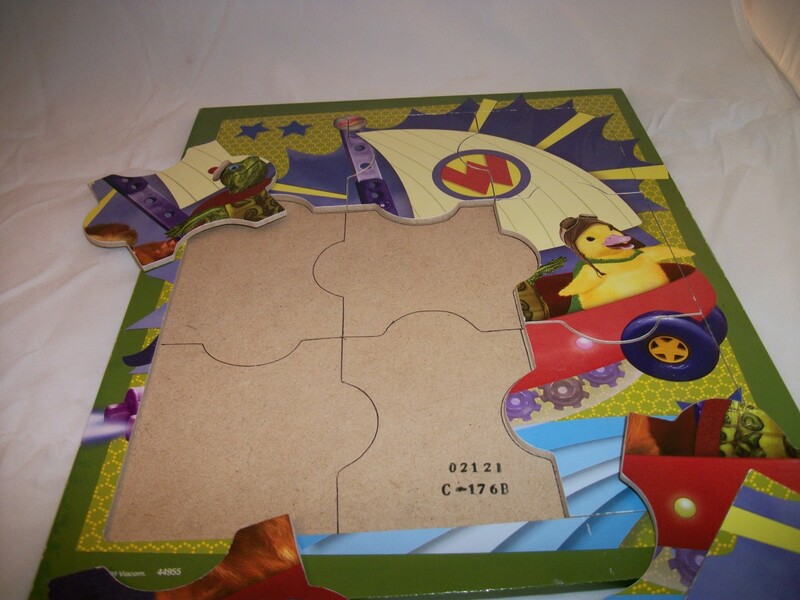 Another example would be a 4-piece puzzle with shapes, such as a circle, square, triangle, and rectangle. 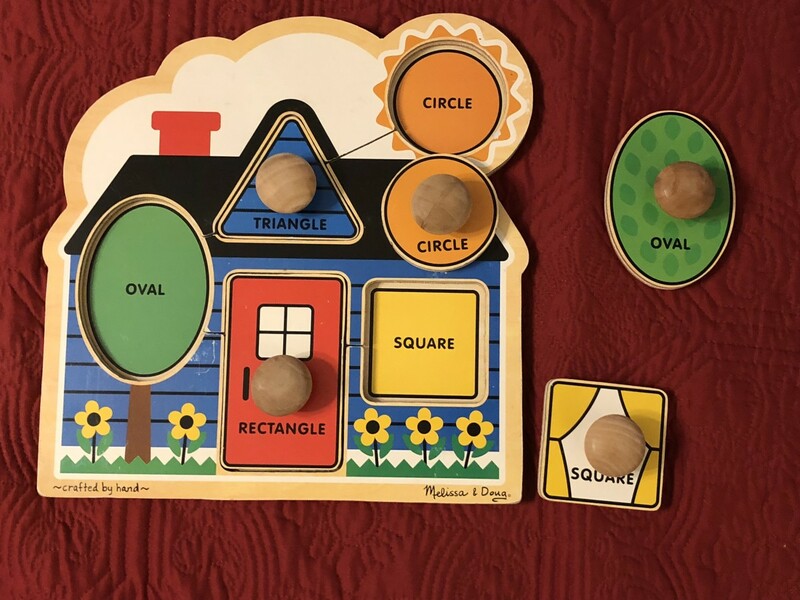 My favorite is a 5-shape puzzle that is a house. The door is a rectangle, the window a square, the sun is a circle. From simple 4-piece puzzles, progress to non-connecting puzzles with up to 12 pieces. 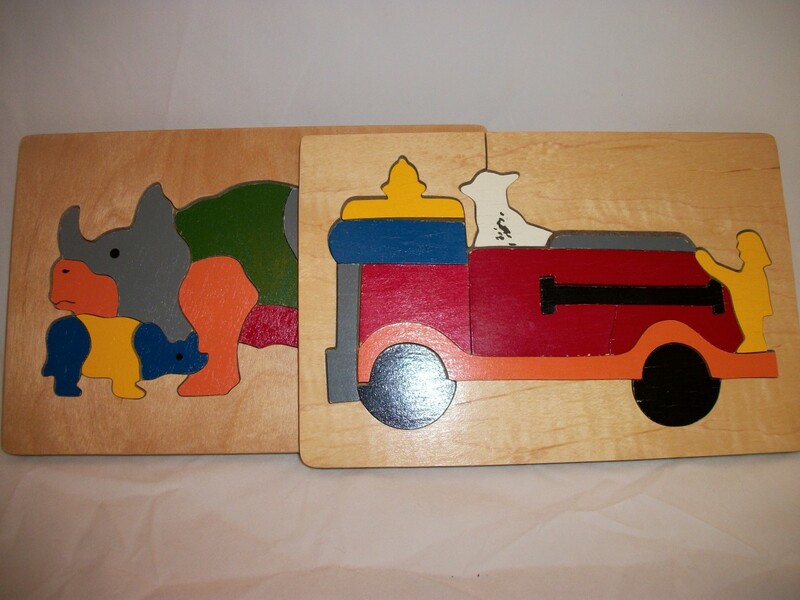 Examples might be puzzles with zoo animals, farm animals, fish, dinosaurs, cars, or trucks. 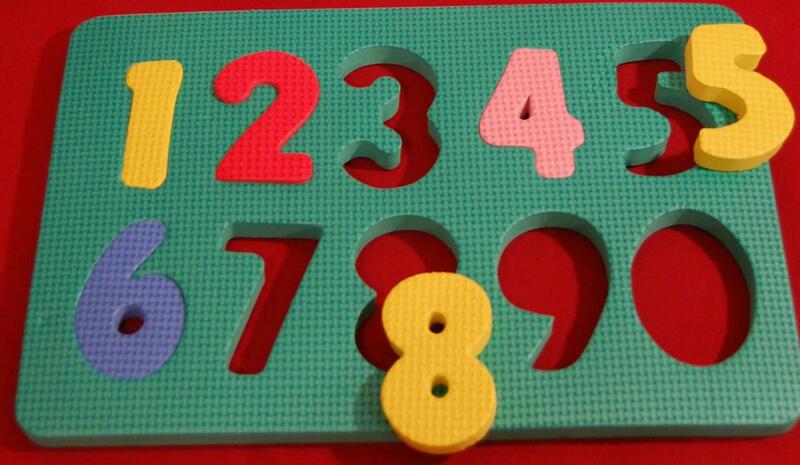 If the puzzle is too difficult for the child, place half the pieces in the board for the child. Talk about the shape, color, or other attributes of the remaining pieces to be placed. 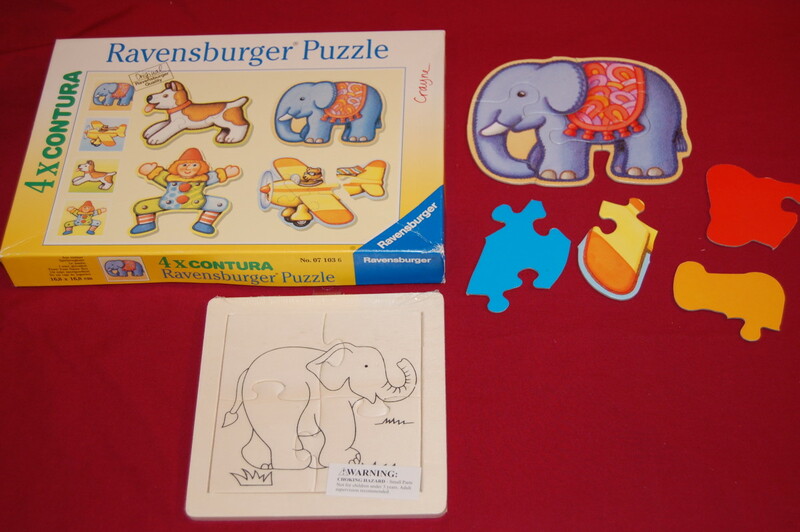 Non-connecting puzzles can however be difficult for young children. If you present a puzzle with six to ten shapes to a child that barely knows four shapes, that could be too hard for the child. 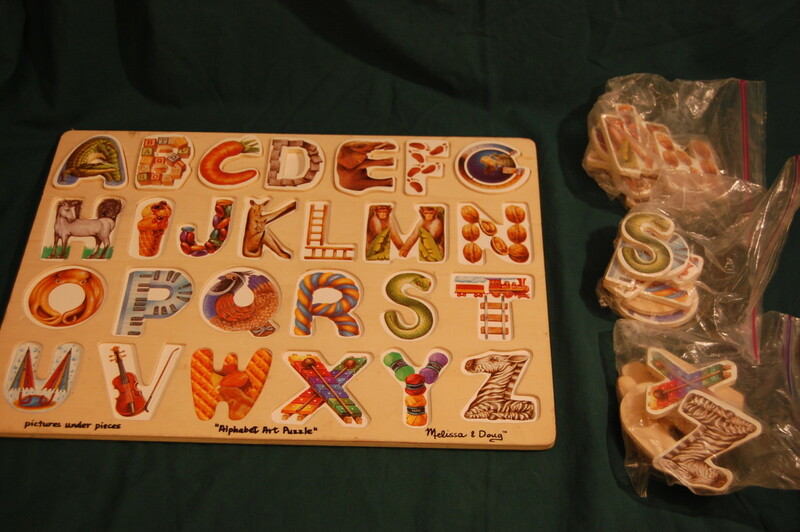 Likewise, an alphabet puzzle with 26 pieces would likely be too difficult for a child who doesn’t know any alphabet letters. 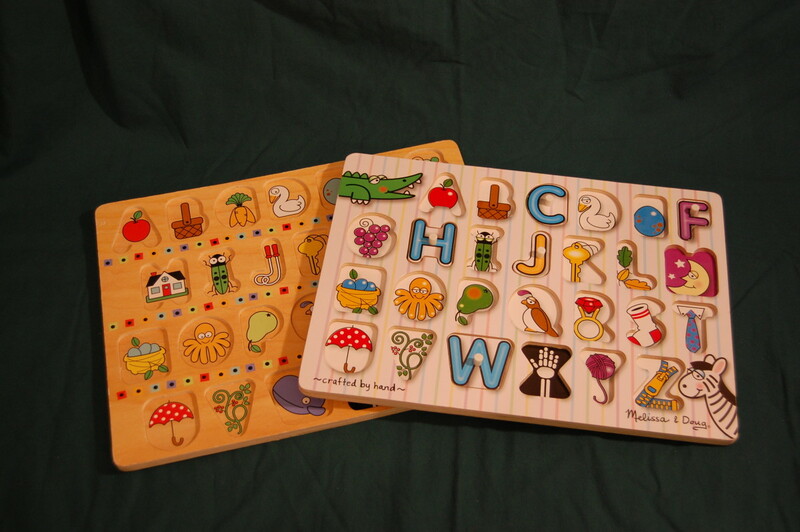 I often use alphabet puzzles with young clients as an alphabet recognition activity to learn letters. Separate the letters by row, and present the letter pieces for one row at a time. A favorite among my therapy kids is the Melissa and Doug alphabet puzzle starting with an alligator for "A". 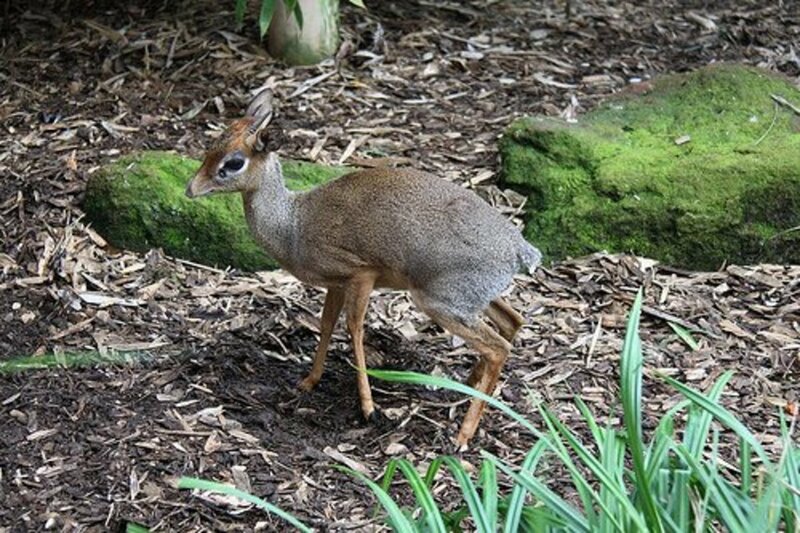 See my photo. 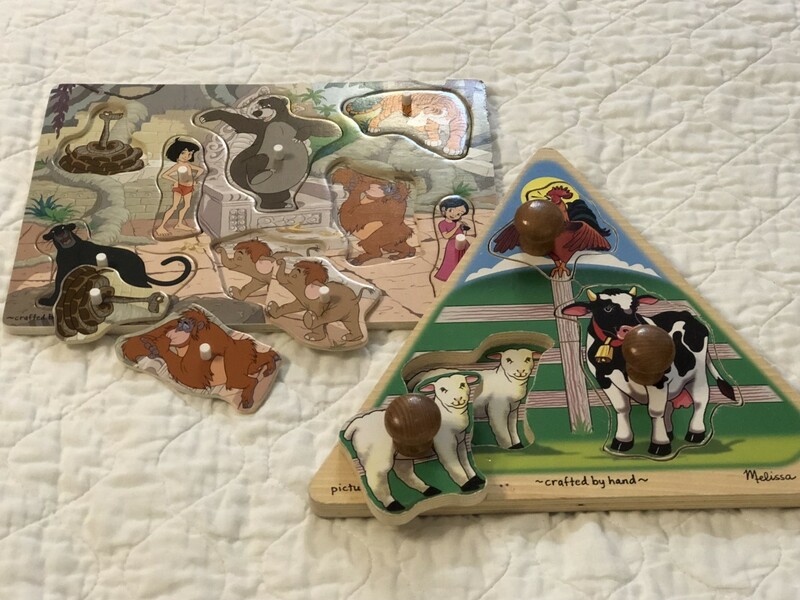 The transition from non-connecting puzzles to connecting puzzles can be quite a jump for young children. The perceptual skills required are much more complex. 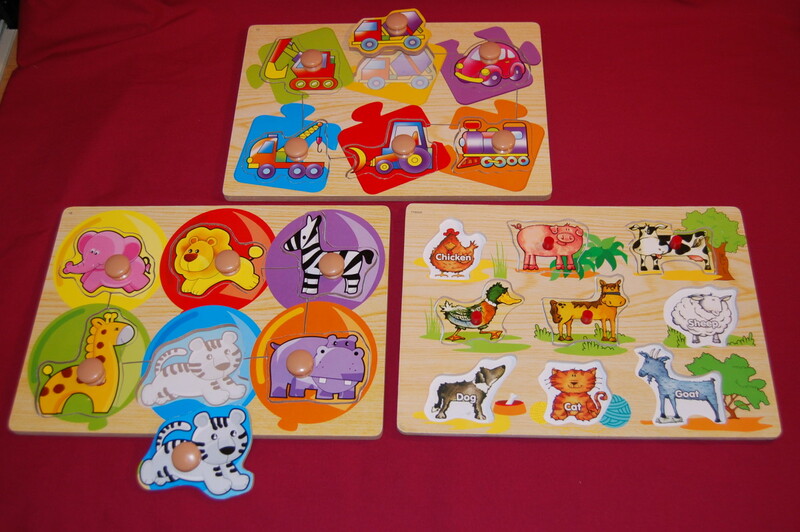 These puzzles are usually board puzzles, and therefore do not have a picture for the child to reference, like a boxed puzzle would. Neither do they have the picture on the board as a reference for where the pieces might go. 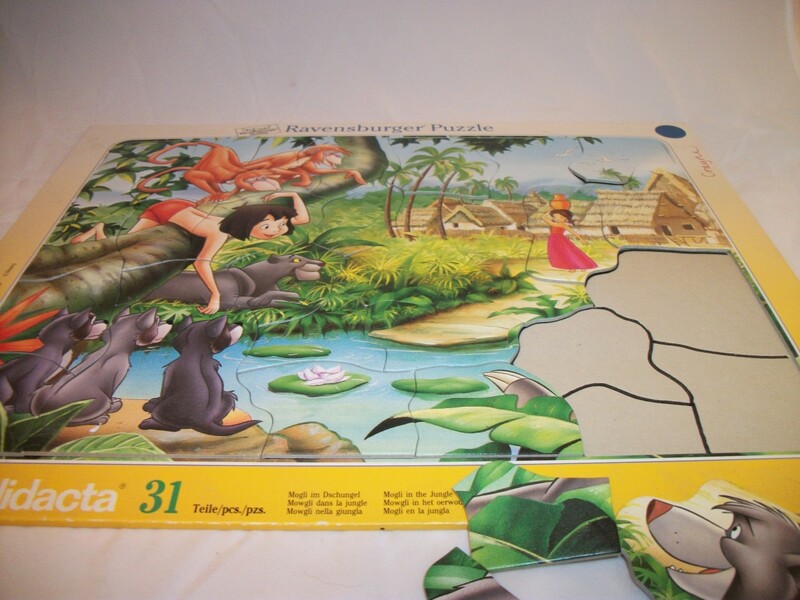 Therefore first connecting puzzles can be very challenging for young children. 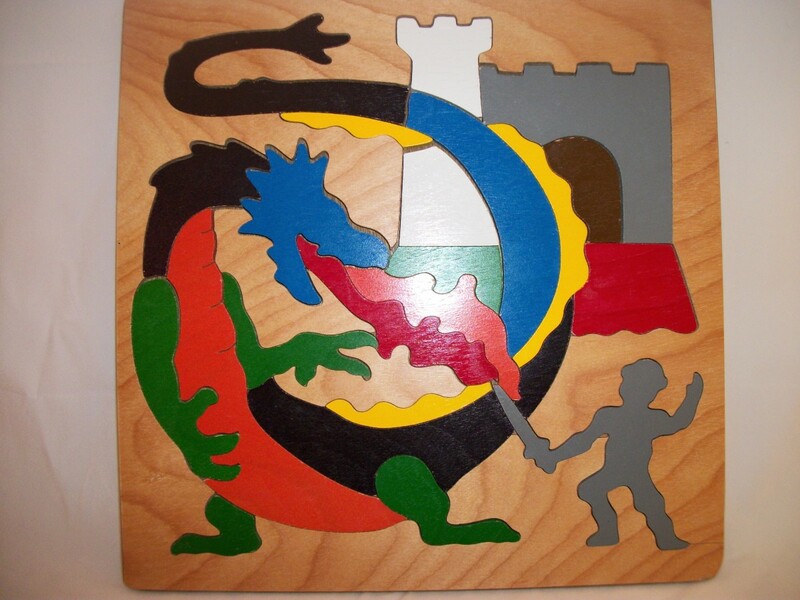 The pieces of connecting puzzles are placed with edges in full contact with other pieces to form the picture, but pieces don’t interlock. 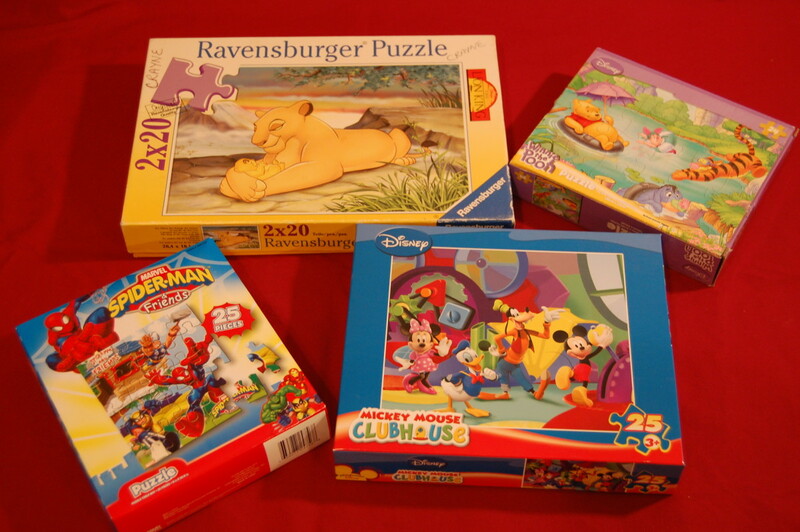 Companies like Hasbro, Milton Bradley, and Playskool make 9-piece connecting puzzles, with popular characters like Elmo, Pooh, Dora, and Diego. Make these puzzles easier by tracing the outline of the pieces on the board. Put the puzzle together with the child, and place some of the pieces. Let the child put pieces together that form the character’s face, and assist with edge pieces, and background images. Another way to make connecting puzzles easier is to take full-frame photos of the assembled puzzle. Print the puzzle, then trim the edges until it fits in the puzzle board. 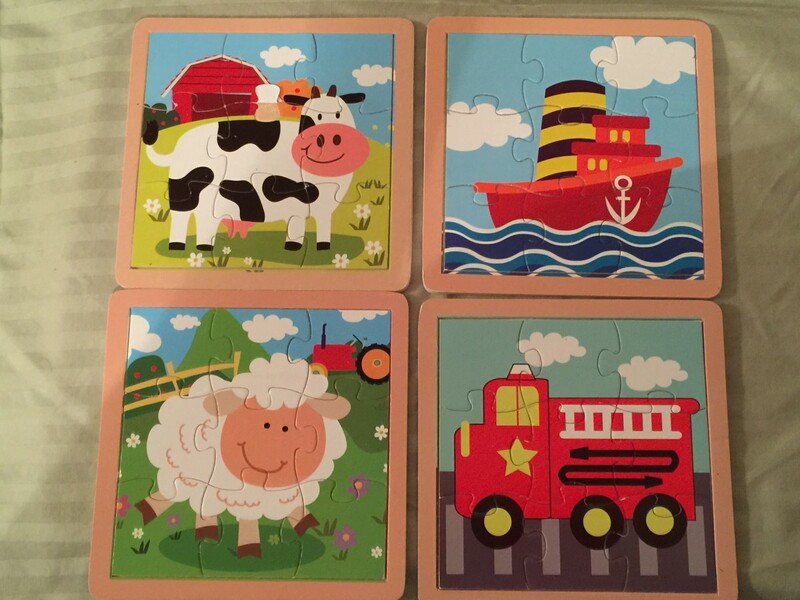 The child can then put the puzzle together matching the picture. I bought several small connecting puzzles from the $1 bin at Target. 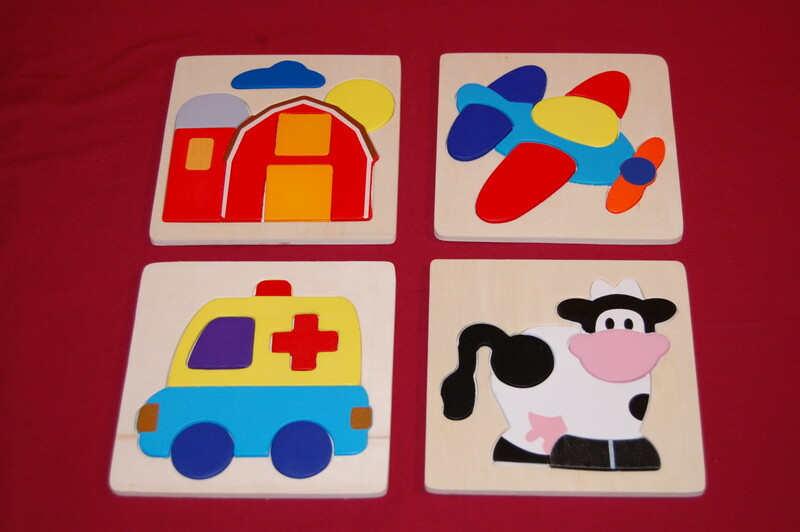 These puzzles had 5- to 7-pieces, and depicted a barn, a cow, an airplane, and an ambulance. These puzzles are challenging! Again I would suggest outlining the pieces on the puzzle board, or placing some of the pieces for the child. For example, place the barn and let the child fill in the windows, or place the body of the airplane and let the child place the wings. Some connecting puzzles come with many pieces. 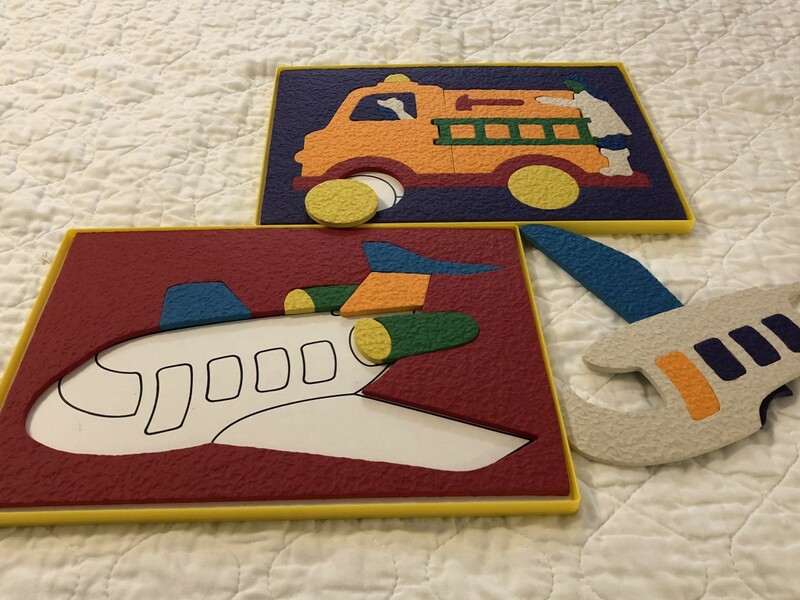 Connecting puzzles from wood or foam have been staples of Occupational Therapy clinics. These puzzles, especially those with 15 or more pieces, are extremely difficult. Without a picture reference, they are often challenging for adults, and nearly impossible for kids. 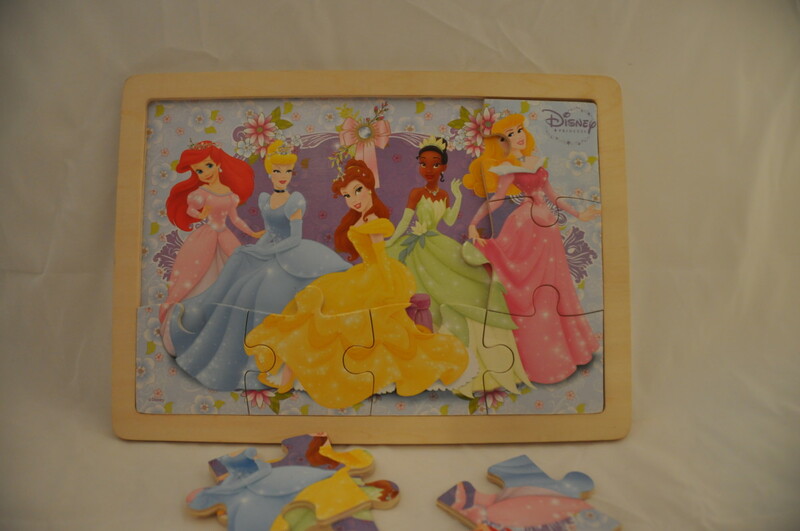 Trace the pieces on the board, or make a notebook with photos of the finished puzzles. Interlocking puzzles, or jigsaw puzzles, are what most adults think of when referring to “puzzles”. 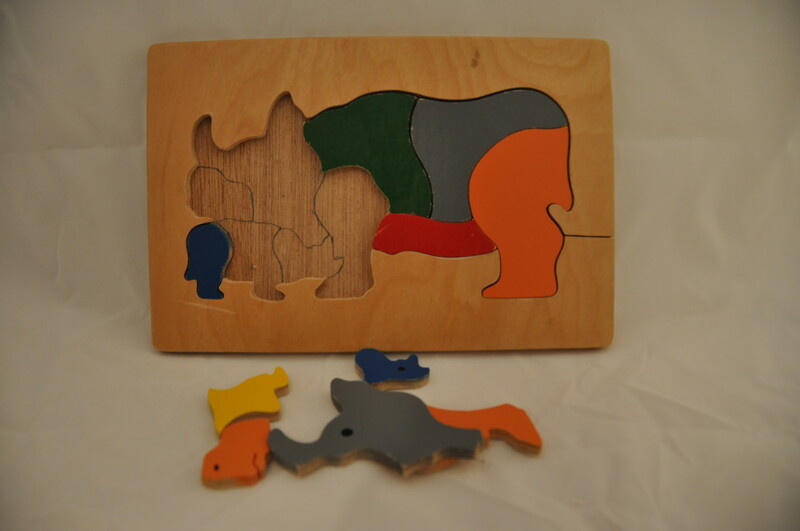 These puzzles have a classic tongue and groove that interlock to hold pieces together. An interlocking puzzle is also connecting, but connecting puzzles are not interlocking. 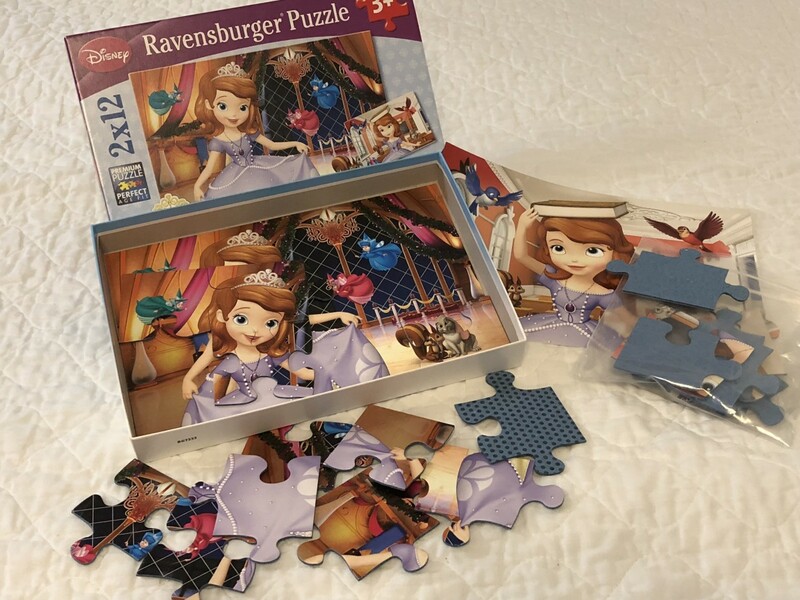 Although you may find 4-piece interlocking puzzles, and a few 5- and 9-piece puzzles, 12-piece puzzles and above are more common. 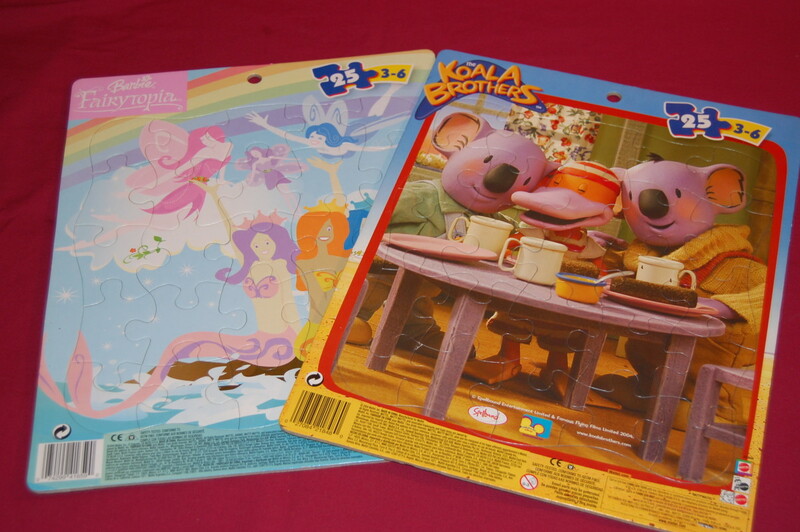 In the past I was able to get 12-piece interlocking puzzles with the full-sized matching picture on the board from discount stores like Big Lot’s, Family Dollar, and Dollar General for about $3. More recently I have had to buy them from Amazon or Walmart for around $10. There are many ways to adapt interlocking puzzles. If time is limited, you can choose a portion of a 60- or 100-piece puzzle, but don’t have to complete the puzzle. Have the child choose the pieces for the main character’s face, or face and body. Reference the picture on the box, and talk about features to look for from the picture. Visit my article, Using Puzzles with a Group of Children for more ideas for working with young children on interlocking puzzles.